The tale of a lovely young girl wickedly abused by the stereotypical witch of a stepmother is one told in various forms in different cultures. Poor stepmoms! They continue to get a bad rap. It appears that the earliest version lies deep in antiquity with some historians maintaining that a Greek slave girl, Rhodope, so named for her rosy cheeks, and who endured various trials and tribulations until she wed the king of Egypt, is the basis for the numerous Cinderella stories. According to one account of the Rhodope fable, an eagle snatched her sandal as she bathed and it fell into the lap of the aforementioned king, who went quite dilly over it, resolving to find the owner as she was sure to be most beautiful. You can guess the rest. The enduring themes of all variations are the gorgeous girl of sweet disposition who’s mistreated and unappreciated until suddenly things are put right and she trips off to a life of luxury and ease with a rescuer, usually a prince. Shoes tend to feature, along with dainty feet, rags, ashes, housework and nasty sisters; modern retellings are embellished with magic wands and pumpkins. My Cinderella had a bad a time of it, like all the classical Cinderellas, and she too finds happiness with a prince of a man, but mine, though uncomplaining like all the others, has a bit more gumption, and in addition is a most accomplished knitter. This is because her poor sainted mother (look, they’re always wonderful mothers in these stories) took the trouble to teach her when Cinderella was very young. Therapists will tell you this was a good thing for both of them as they bonded very well and Cinderella was able to draw on all her happy memories to sustain her through her terrible situation during the stepma interlude. I do feel however that her male parent must have been quite sorely lacking in that he was either totally unaware of his daughter’s situation or not anxious to do anything about it. Whatever the reason, in my book he was a complete and utter disaster as a caregiver. Anyway, I digress from my story of the motherless, but knitting-empowered Cinderella. One day, quite early on in the stepfamily relationship while the evil stepma was gritting her pointed little teeth and pretending to be nice to Cinderella who was not yet lumbered with all the chores, she came upon Cinders knitting away at a lovely sock. This impressed her no end for Stephorror and her miserable daughters were all perfectly hopeless at any such dainty arts. Now remember, in those days one could not waltz into a shop and purchase a pair of socks, handknit or otherwise, for the perfectly obvious reason that all articles of clothing had to be made at home by industrious housewives, or if one was lucky, by loving maiden aunties or grannies, or specially ordered from some soul seeking to supplement the family income. Anyway, my point is that Stepmutter, absolutely not slow to seize upon an opportunity, immediately saw the potential in Cinderella’s skills and promptly demanded the finished pair of socks. Cindy sweetly gave them to her, but of course the ugly stepsisters quarreled most unpleasantly over who was to have them, finally sulking off into separate corners, each clutching a sock, which try as they might, and even allowing for the wondrous elasticity of handknitted socks, they couldn’t possibly tug over their great ugly knobbled feet. But they whinged and they cringed, they snivelled and snorted and generally made themselves even more unpleasant than usual so their doting mama promised they would have socks. She would obtain yarn as soon as she could and Cinderella would knit them socks to fit. Before long Cinderella was getting stuck with more and more chores, and being not only a very beautiful young woman, but a smart one too, wisely chose not to mention that she had spun the yarn. And on a drop spindle yet, for where would she have been able to find a spinning wheel? It was something of a bother for the old cow to find someone who was prepared to spin yarn for her, but she managed it and indeed was fortunate enough to find a spinster, who as we all know is an unmarried woman, but probably not all of us know that the unmarried woman in times now fortunately gone by often did the spinning for the household. Anyway, she secured for herself and her miserable offspring a fairly good and steady supply of yarn. Poor Cinderella now found herself in an even more difficult situation than before, for not only did she have a never-ending work schedule, but knitting, which had previously been such an enjoyable outlet for her, became a burden in that she was forced to use her skills in the service of that horrendously ungrateful trio. So she cooked and cleaned and polished and mended until she finally could settle down before the fire to work on a pair of stockings for one of the miseries. The spinster meanwhile, also not slow to spot a good thing when she saw one, began to dye her yarns in enticing colours which Stepmonster just couldn’t resist buying. Time passed, and Cinderella knitted away on socks for the hags, who demanded more and more pairs of the wonderfully patterned ones that her nimble fingers created from the beautifully coloured yarns. She worked late into the night, getting more and more sleep deprived, all the while carefully hoarding the odds and ends of yarns left over. The knitting took on that soothing quality all knitters know. As her fingers flew, her mind raced and her plans grew. She determined, did my feisty Cinderella, that she would run away just as soon as she was able and make her way to a city, there to set up a teensy enterprise knitting gorgeous garments for discerning ladies. See, her late mama had impressed upon her the need for a woman to have the skills necessary to support herself in the world, and not to be dependent upon a man. In the world in which you and I are fortunate enough to live, there is no question that my heroine would have been a most competent executive woman. She would have worn red power suits and Manolo Blahnik shoes. She’d have jetted about all over the world, sourcing yarns and designs for her multi-million dollar knitwear business, but that time was still far ahead in the future. So, in the absence of any kind of shoes, Cindsy planned and prepared while she turned the knitted heels and grafted the toes of the socks that would greatly improve the appearance of the stepcrowd’s ugly feet. Before she could run away, she had to give some thought to suitable clothing, and using the leftover yarns was an obvious place to start. 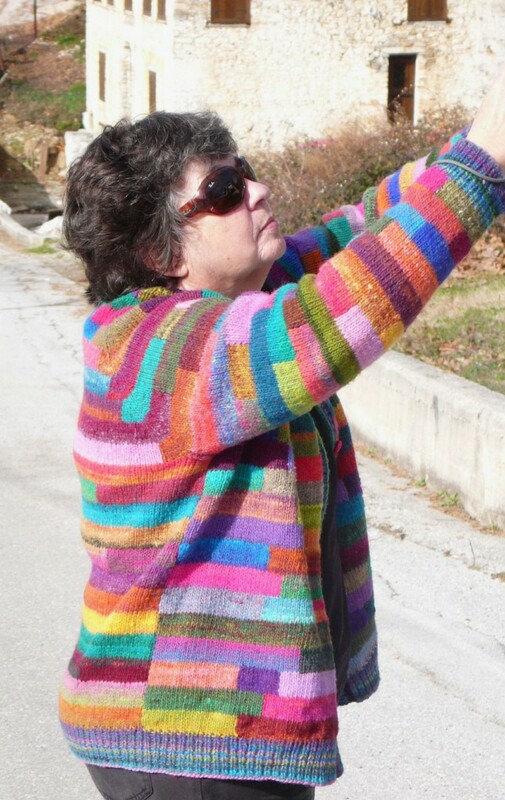 Like all knitters she faced the challenge of how to make the best use of those oddballs, and after careful consideration, she began to cast on stitches for a cardigan. She managed to work on it a little at the end of each long day, content in the knowledge that she would soon set off on her great adventure, until it was done. Well, she never actually got to run away. Before long all that stuff you remember, or jolly well should from your childhood, about the great excitement of the ball, the prince and his search for a bride, the fairy godmother (who as far as I am concerned should have shown up a great deal earlier in Cinderella’s young life, though I suppose better late than never) pumpkins, glass slippers, coaches and so on came about. We’ll fast forward a bit, quite a bit in fact, to find my Cinderella working away happily in her knitting room, in one of the palaces that she and the charming prince occupied at various seasons. With all her tools to hand and every kind of yarn her heart could desire did Cinderella pass her peaceful time. 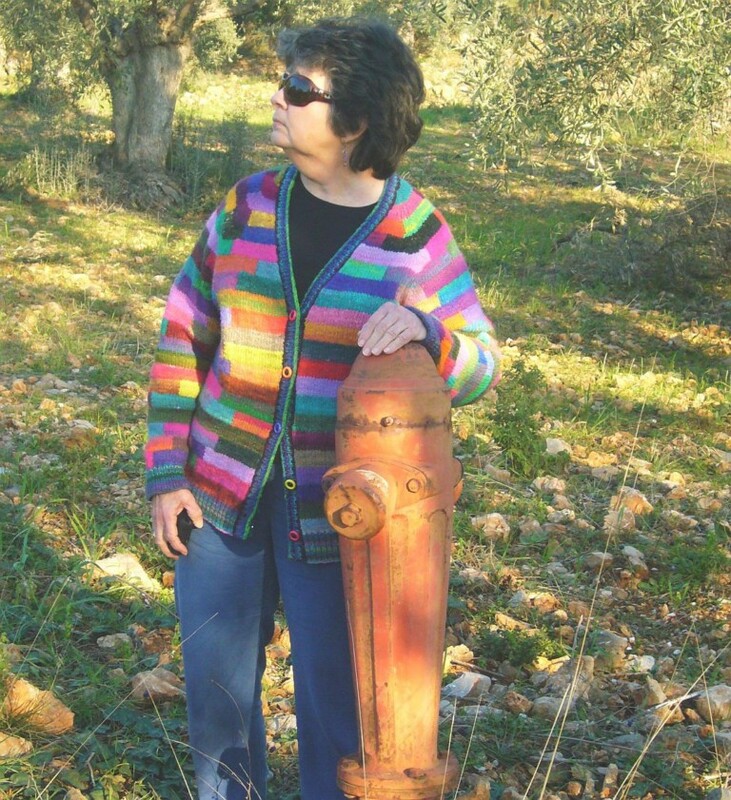 She never got rid of that cardigan. Indeed she kept it with her always as a reminder of how far she had come, even though she now had whole armoires full of the beautiful things she had knitted, very becoming to a beloved, good and kind princess. It only remains for me to add that the Prince adored her, her mother in law treasured her, and as for her father…well the best I can do for him is that he continues to live with the trio, feeling awfully sorry for himself. That poor man! I can’t imagine what he went through, and how difficult his life must have been by today’s standards. I’ve lived in the Austrian Alps. I’ve hiked there, even in winter. Not in blizzard conditions of course, but certainly through deep snow, equipped with the proper boots, thermal underwear, ski jacket, hat, gloves and trekking sticks. The whole nine yards. Note, I said hike. Not me for the ski run and all that suicidal careening down gradients designed by Nature for mountain goats to frolic on. Ah yes, hats. 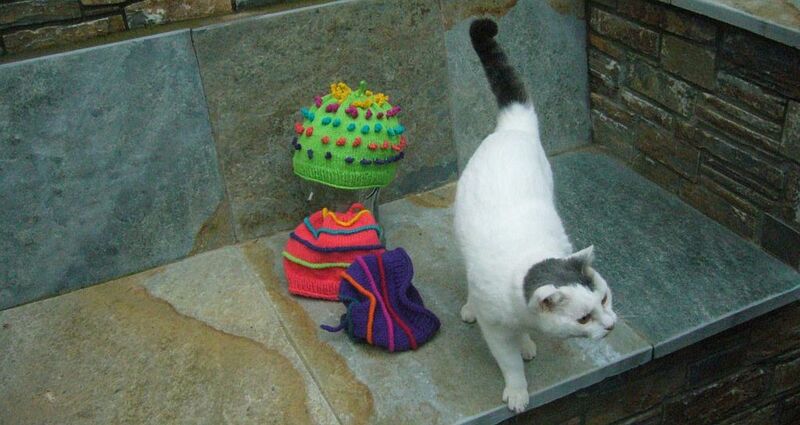 Many and varied did I knit. I’m not convinced that much heat is lost through the head, and apparently scientists have more or less debunked this notion, but certainly a warm, fleecy cover on one’s noggin is a comfort, and so much better if the headgear is bright of colour, in my humble and much-biased opinion. Back then to my favourite older man. Much older man. I suppose his bearskin hat did ward off the elements to some extent, though as I’ve mentioned before he seemed to have trouble keeping it firmly affixed to his head, given that the leather ties had been broken and then knotted together again. I’m no historian of Neolithic clothing but although wool was known and used by Neolithic peoples in other parts of the world, it appears this excellent insulating material wasn’t available to Otzi and his folk. Seems sheep had yet to find their way high up into the Alps, or at least trade in fleece hadn’t begun here at that time; I’m happy to be corrected on this point. Ever since we met, Otzi and I, his lack of a snugly-fitting hat of warm wool has spun its way through my imagination on occasion. A hat for Otzi should surely not be coarse and bulky like skins and furs, but soft and cosy. It should be somewhat waterproof, as indeed his bearskin cap was, but able to hug his head against the vicious winds that whip and rip through the Alps. Otzi needed the protection afforded by felted fabric. Austria is famous for its wonderful Loden cloth which is not actually felted, but fulled. 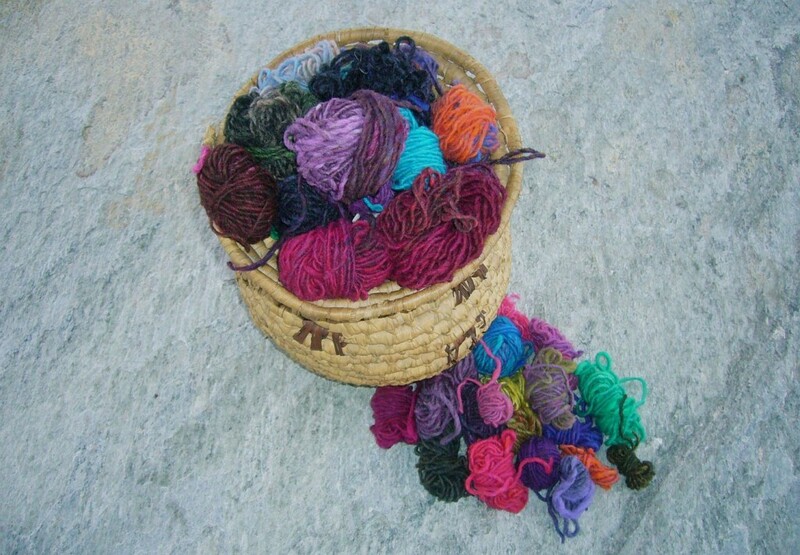 Wool yarn is first loosely woven or knitted, then subjected to a controlled process of agitation and boiling, until the wool fibers shrink and mat together into a dense fabric. This density makes fulled fabric exceptionally warm and very hardwearing; it does not ravel, it can be cut, and it can be moulded to any shape. I have quite a bit of oiled Shetland tweed yarn in my stash, a perfect yarn for my tribute to Otzi. Such yarns, spun in the oil, can be unappealing to knitters who aren’t aware that once the finished item is well washed in hot soapy water the oil is removed and the yarn fluffs up, becoming much softer. Tweed yarn for Otzi then. Tweed, with all its inviting little flecks of color, to warm and cheer him. Two colours, I decided. Two colours, as his clothing had been so drab. Brown for earth and rock, blue for the sky so far above him. To think he perished, alone, all those thousands of years ago, and now esteemed scientists devote their careers to him. His hat didn’t take long to knit. 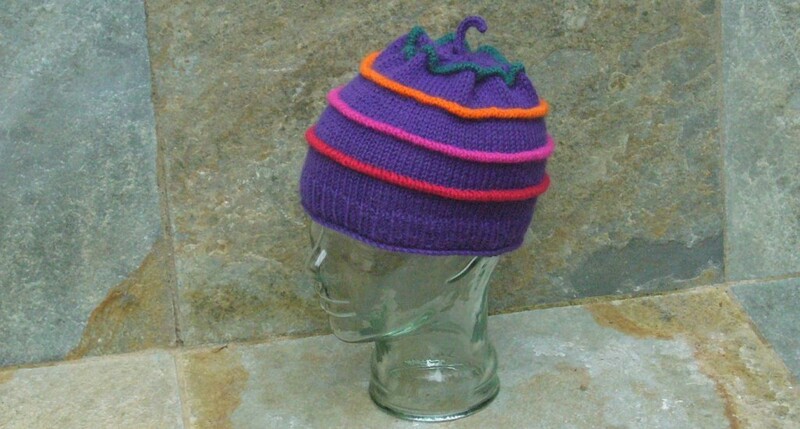 I used a larger size needle than the yarn usually calls for and knitted an overly big hat. 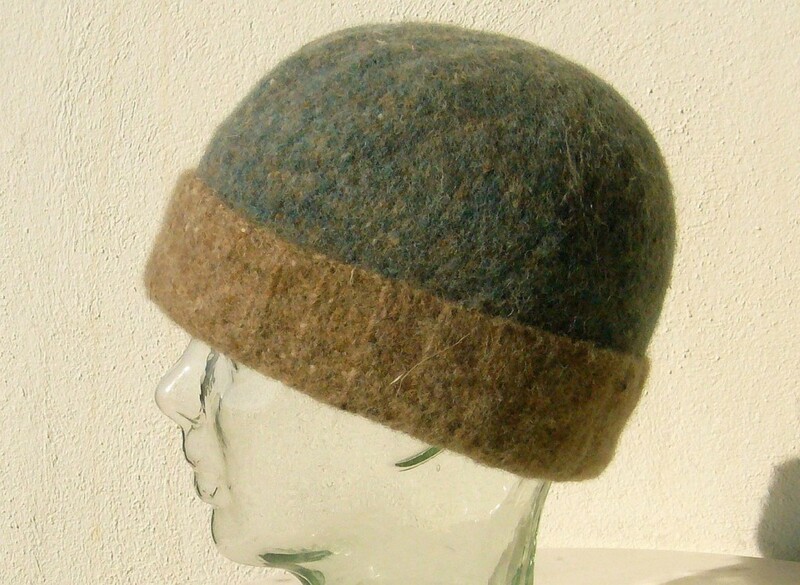 I gave it a deep brim so that it can be worn doubled, or pulled down to cover part of the face. The resulting hat, prior to fulling, was of course floppy and stringy and looked quite odd, but the magic was yet to come. 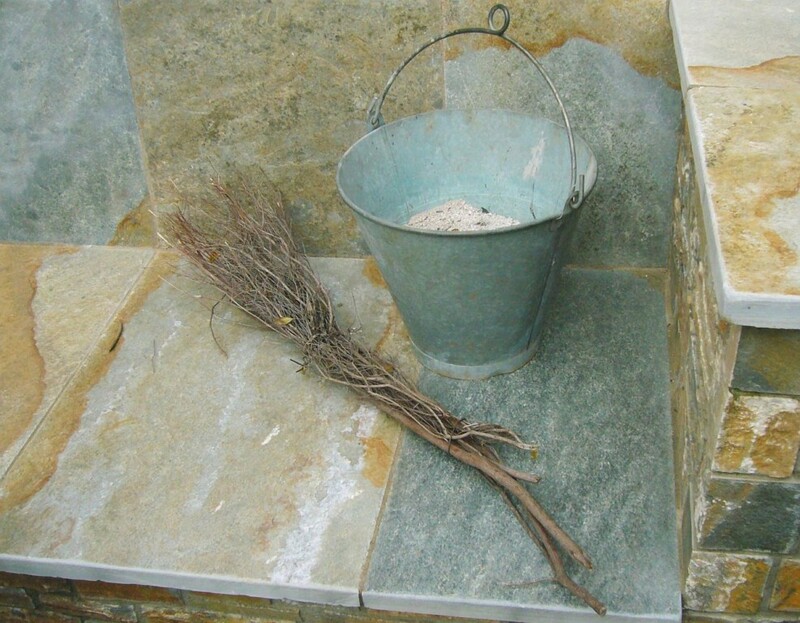 Bucket of very hot water, bucket of cold water, bottle of dishwashing liquid, rubber gloves, and go… I love this part! The idea is to agitate and aggravate the woollen item by rubbing it hard in the soapy water, plunging it in and out of hot and then cold water. The water has to be changed often so that it remains as hot/cold as possible, and the item must be checked frequently to monitor the rate of fulling and shrinking. When satisfied with the result, I rinsed it thoroughly and rolled it up in a towel to blot excess moisture. Poor Jason sat outside in the sun all day while Otzi’s hat dried, never saying a word. Would Otzi have liked this? 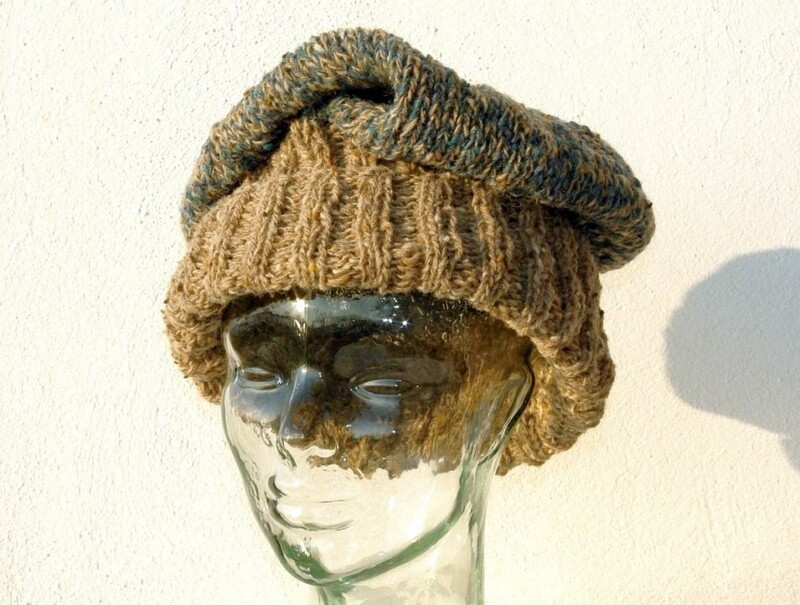 It’s likely that I’ll knit another hat for Otzi – there are so many exciting possibilities. 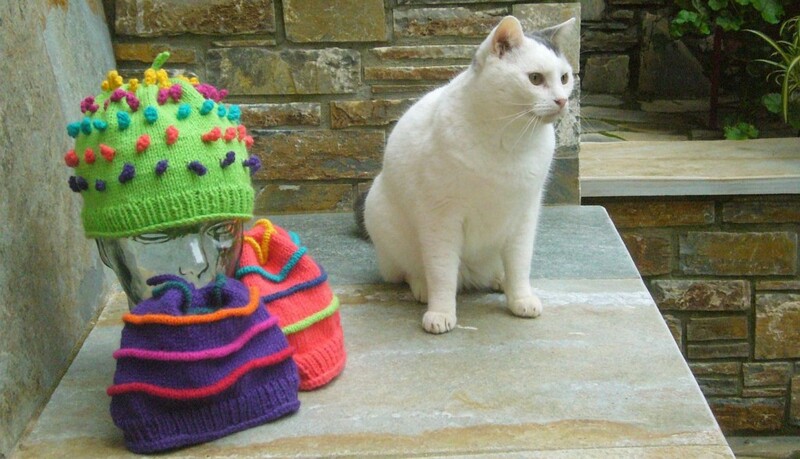 Raki , convinced as always that he’s indispensable, was determined to be of assistance whilst I was trying to photograph these hats, gifts for friends’ children. 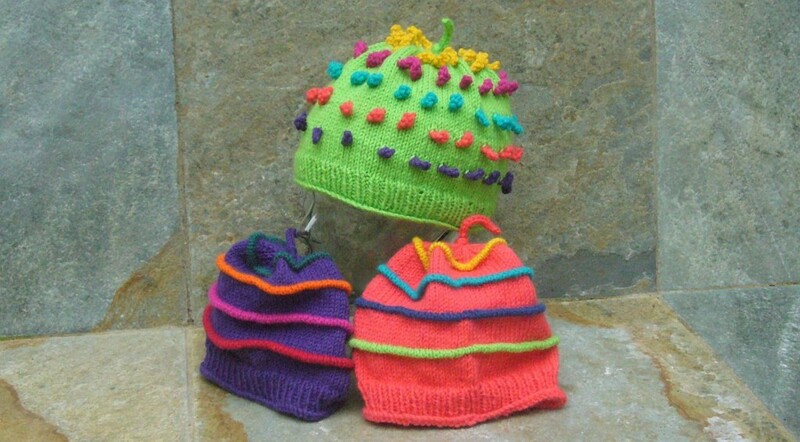 I love knitting what I call my Happy Hats which brighten up wintry days with cheerful colours, but Raki also has a thing for knitting and it’s difficult to keep him away. 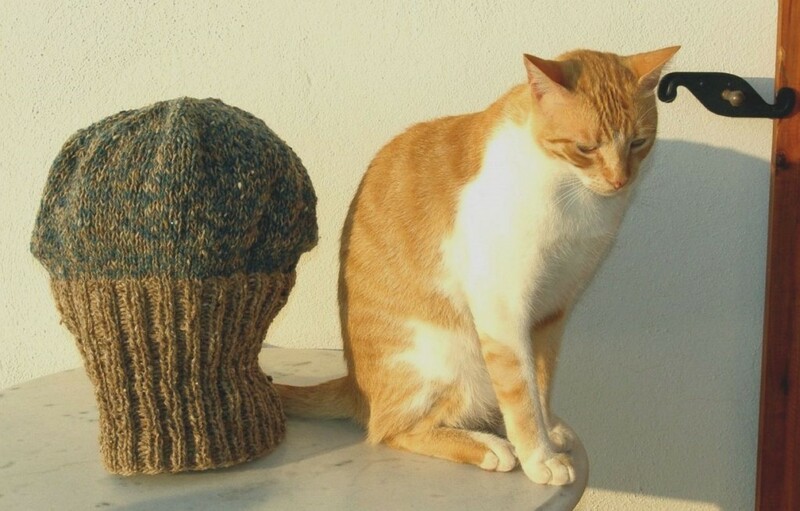 Any knitter who has cats (or do the cats have us?) is familiar with the routine of cat grabs yarn, cat runs off with yarn, cat likes to sleep on knitting in progress, but Raki has taken this to a whole other level. Raki is a Turkish Van cat; his ancestral homelands are the area around Lake Van in Eastern Turkey, a region inhabited and criss-crossed since earliest antiquity by peoples who wove intricate carpets, and created exquisitely coloured felted wool rugs, tents, hangings, articles of clothing and horse trappings. Somewhere in Raki’s DNA is an understanding of yarn, of textiles, of wool, which of course explains his keen interest in deconstructing my efforts and obviously has nothing to do with his highly developed ability to destroy whatever takes his fancy. Are these yarns soft enough? My yarn stash cannot be described as small, and it’s certainly very eclectic. Colour dominates the collection of almost every type of yarn, but wool and wool blends are well represented from tweeds to angora, mohair to baby-fine merino, worsted weight basics to the wildest novelties. I confess I collect. 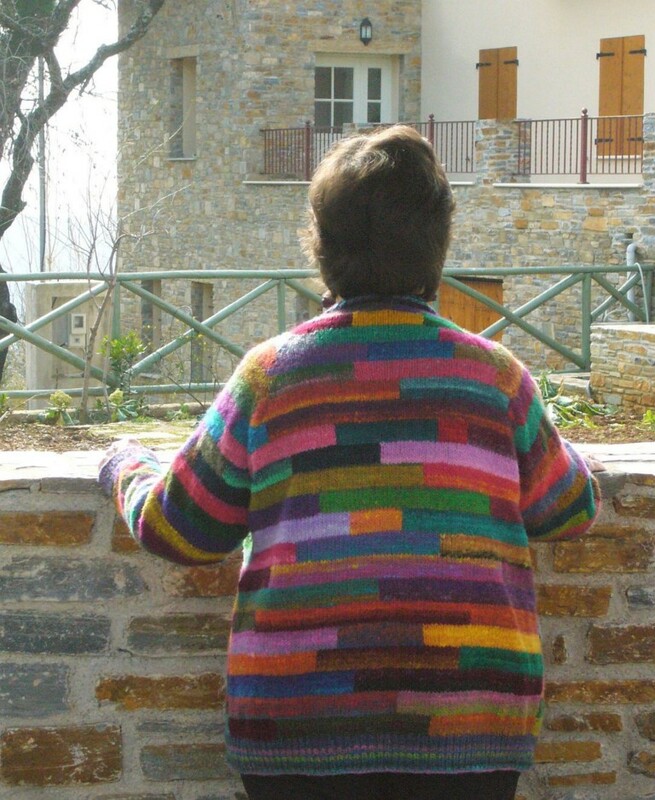 Many of my yarns, whether they have been knitted up or not, function as mini travel diaries recording people and places encountered. While delving through the stash earlier in the week, I chanced upon a single ball of Cabaret by Stacey Charles. A burst of colour! 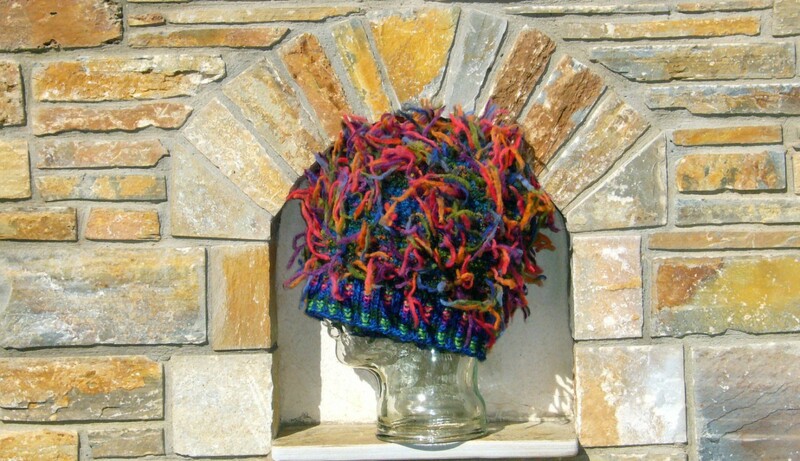 Just too, too much but perfect for a zany hat. Medusa was a beautiful priestess in the temple of the goddess, Athena, which required her to lead a celibate life. Unfortunately, Poseidon rather put an end to her vows of chastity. Depending on which version of classical Greek mythology you read, their love was either consensual (and one hopes so for the poor girl’s sake) or an act of violence. Whichever, Athena was less than thrilled and took a terrible revenge on Medusa, making her face hideously ugly and turning her lovely locks into a seething mass of poisonous snakes. Medusa was transformed into a monster. Shame on Athena, for she was, among other things, the goddess of reason, but obviously reason surrendered to rage. Medusa, no surprise, fled, and wandered about turning to stone anyone who had the misfortune to gaze upon her ghastly face. Greek mythology is absolutely fascinating, but perhaps not reading material of choice for the faint-hearted!